If you love playing board games as much as we do, Get On Board Café in Madhapur is going to be your new adda. Get On Board Cafe has been around for about 6 months, and it lets you and your squad have fun over board games. Housing the personal collection of Sireesha and Bhujang Behara, it has over 700 board games for you to play. They have been classified based on the difficulty level, and you can spend an entire day laughing and strategising here. From popular games like Scrabble and (Game Of Thrones themed) Monopoly to award winning games like Ticket To Ride, as well as the smallest and the largest board games in the world — they have it all. Here, any one above the age of 8 can find something of their liking, and it has become a host to kitty parties, birthday parties, dates and reunions too. You can indulge in these games at a price of INR 99 per hour, per person or get the day pass at INR 299 per person. Another fun part is that you don't have to read the rules of the games, as the cafe has game gurus, who will explain them to you. 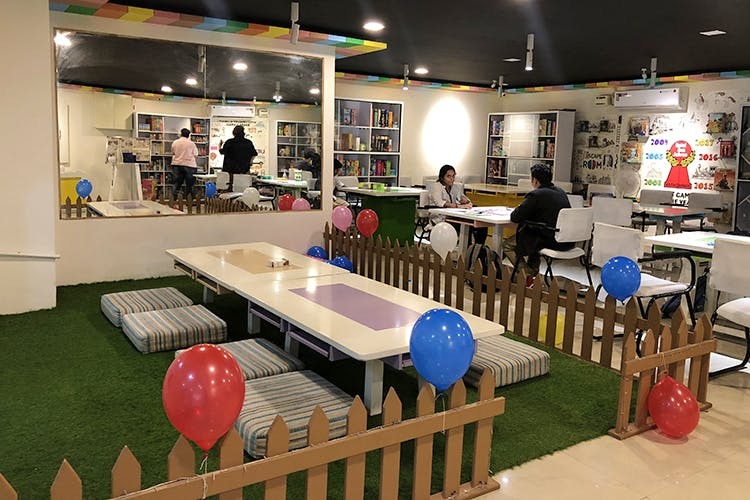 This is also India's biggest board game, and the news is that the owners will soon be opening the world's first rooftop board game cafe just above Tollgate. So, watch out, and remember, you heard it first at LBB. Although they have many food options between a range of INR 79 - INR 149, the food at this cafe is mediocre at best; and takes too long to serve. So, we say skip the food and go here for a stressbuster.